This video of handicapped, Chassidic 9-year-old Chizky Tornheim has taken the internet by storm. 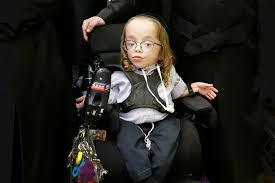 Chizky Tornheim of Kiryat Sefer was born with Osteogenesis Imperfecta type 2, an inherited connective tissue disorder found in 1 out of 60,000 live births, and nearly always results in death during infancy. Several years ago, Chizky was transferred from a school for sick children to a regular school, and he even skipped a grade. His video appeal to school principals to enable other special-needs children to attend mainstream schools has turned viral in Israel. In this interview with Channel 13, Chizky also gives some powerful chizuk. How often do we hear a neshama speak?